This recipe for breakfast egg muffins is an easy grab and go option for busy mornings. 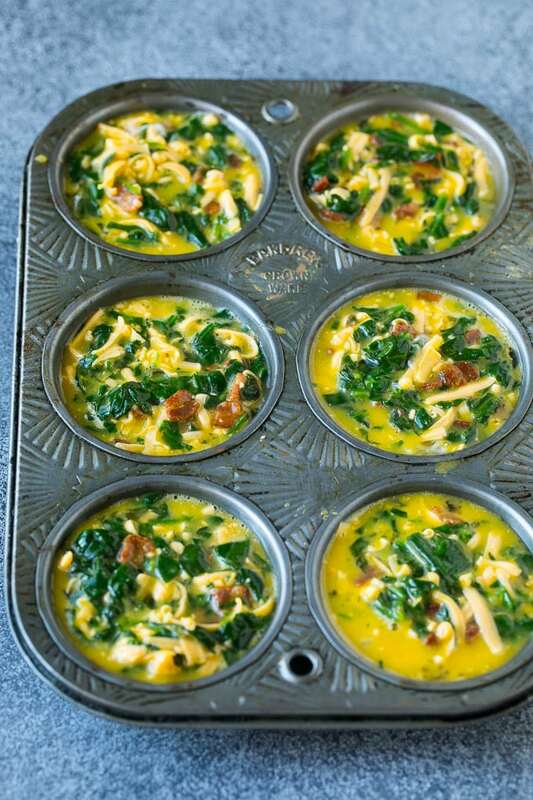 Egg muffins are loaded with bacon, cheddar cheese and spinach, and are packed with plenty of protein! I’m always on the lookout for quick breakfast choices that are high in protein and lower in carbs. I often turn to ham and egg cups, breakfast burritos and these delicious little egg muffins. Eggs. It’s what’s for breakfast pretty much every single day at my house. I eat eggs every morning because I love to start my day with some protein, and my kids eat scrambled eggs most days too along with cereal or yogurt. After making the same scrambled eggs for the 10th day in a row, I decided we needed to shake up our breakfast routine and try something new. 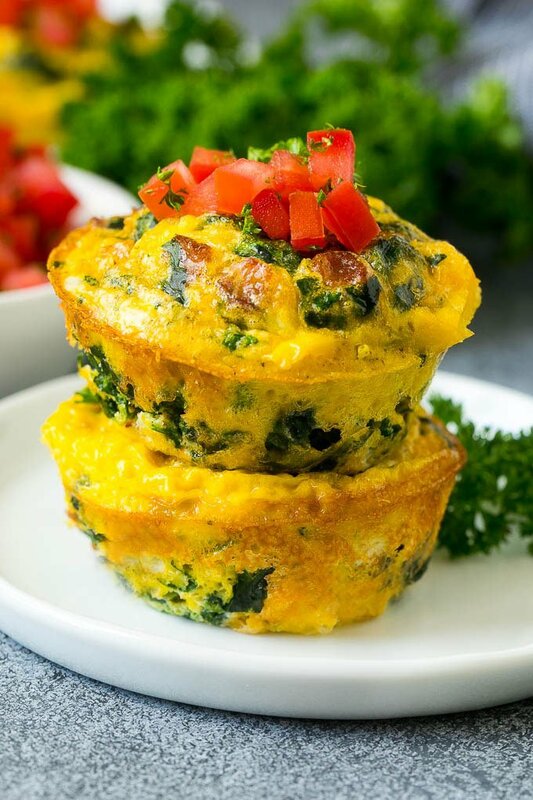 I whipped up these fun breakfast egg muffins in just minutes for a fresh take on a classic recipe. 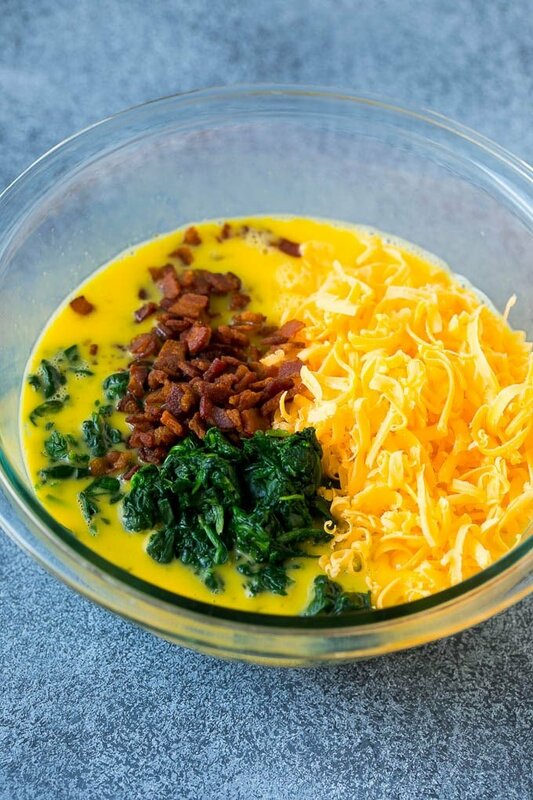 This is a simple recipe made with beaten eggs, spinach, bacon, cheese and seasonings. Everything gets mixed together and then is poured into muffin tins and baked until set. 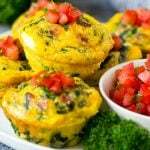 You can eat you egg muffins as-is, or add a topping of diced tomatoes and herbs. This recipe can easily be doubled to feed a larger crowd. To save on prep time, buy pre-cooked bacon and pre-shredded cheese. I like to use fresh spinach that’s been cooked and then squeezed to remove excess water. You can also use thawed frozen spinach, just be sure to get all that water out! Be sure to grease your muffin tins well so that your egg muffins don’t stick to the pan. Alternatively, you can use silicon cupcake liners in your pan. Looking to save a few calories? Use 4 egg whites and 3 whole eggs rather than 6 whole eggs. The easiest way to reheat egg muffins is in the microwave. I cook each egg muffin for approximately 30 seconds or until just heated through. Be sure not to over cook them or your eggs might become tough. How long can I keep egg muffins in the fridge? These egg muffins keep in the fridge for 3-4 days. If you have any left over, you can always freeze them for another day, then reheat in the microwave when you’re ready to enjoy them. 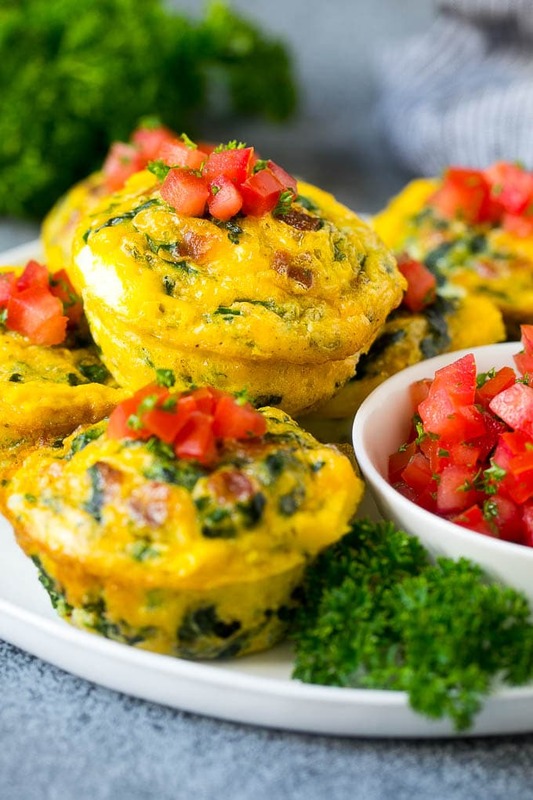 Egg muffins will keep in the freezer for up to 2 months. There are SO many different ways to customize your egg muffins! I like to choose one protein, one cheese and one veggie to mix and match and create new flavors. I make breakfast muffins almost every week; they’re the perfect way to get your day off to a healthier start and the protein will help keep you full all morning long! This recipe for breakfast egg muffins is an easy grab and go option for busy mornings. 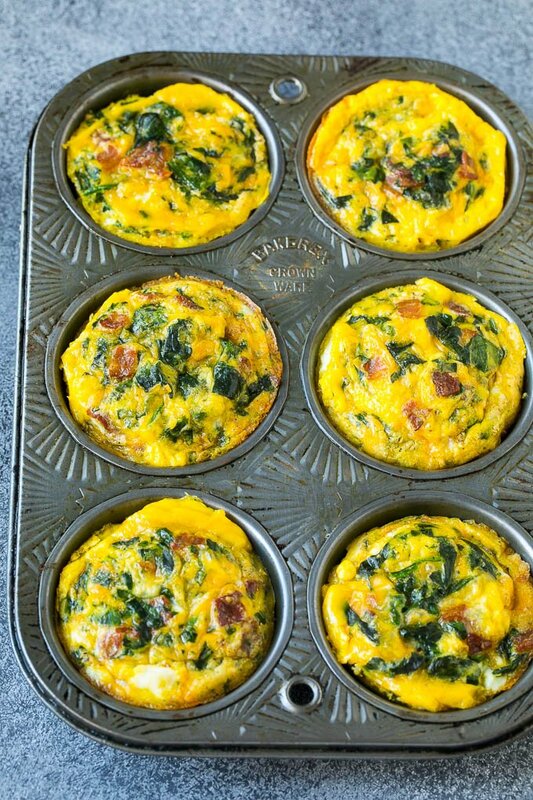 The protein packed egg muffins are loaded with bacon, cheddar cheese and spinach for maximum flavor! Preheat the oven to 375 degrees. Coat 6 cups of a muffin tin with cooking spray or line with paper liners. Crack the eggs into a large bowl. Use a Braun MultiQuick 7 Hand Blender or a whisk to blend the eggs until smooth, this will take less than a minute. Add the spinach, bacon and cheese to the egg mixture and stir to combine. Divide the egg mixture evenly among the muffin cups. Bake for 15-18 minutes or until eggs are set. Serve immediately or store in the refrigerator until ready to eat. Top with diced tomatoes and parsley if desired. 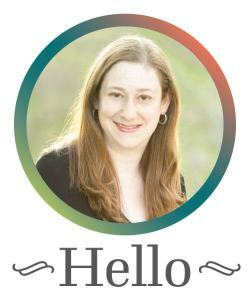 This is a sponsored conversation written by me on behalf of Braun. The opinions and text are all mine. This post was originally published on June 27, 2016 and was updated on March 17, 2019 with new content. How on earth did you get your eggs to have a domed top. Mine ALWAYS deflate in the middle. I think the extra ingredients like the spinach and bacon help keep the muffin structure so they don’t deflate as much! This were a big hit at our house! I added diced onion and anout a tablespoon of parmesan. Very delicious. Thanks Sara. This is such a cute idea for breakfast. I’m always looking for more ways to use my eggs. Looks a good brunch app! i need to make these soon! I run out of breakfast ideas everyday. These muffins look delicious yet healthy. These are really great day starter! My daughter won’t eat bread so eating an egg sandwich is always a challenge. I bet she’d love this! Must say the dish and the presentation look so very awesome. Thanks for sharing this easy to prepare breakfast option. I haven’t cooked muffins before. They look tasty. 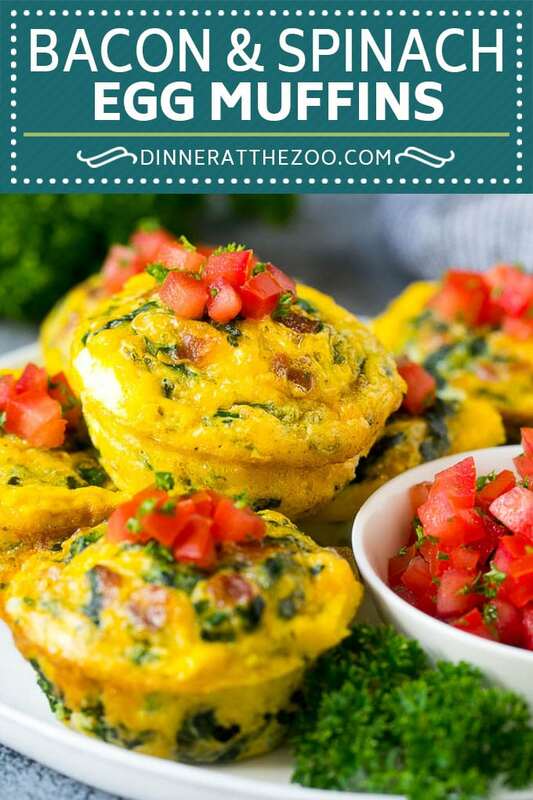 This is one of my favorite breakfast recipes because of how easy it is to change up each muffin; gives you a different flavor for everyday of the week! Easy and nutritious, just like I like it! And the fact that they last for a few days helps, I do not always want to cook every single morning! Recipes like this are a go to while I’ve been Keto. They’re so delicious and easy to make and take on the go. Thanks for sharing! This is such a unique idea! Thank you for sharing the recipe. I think my hubby would really enjoy this. Excited to show him.